It is sometimes hard to see where the highway ends and where private property starts. This example was brought to my attention by a comment left on an earlier post by someone living nearby. 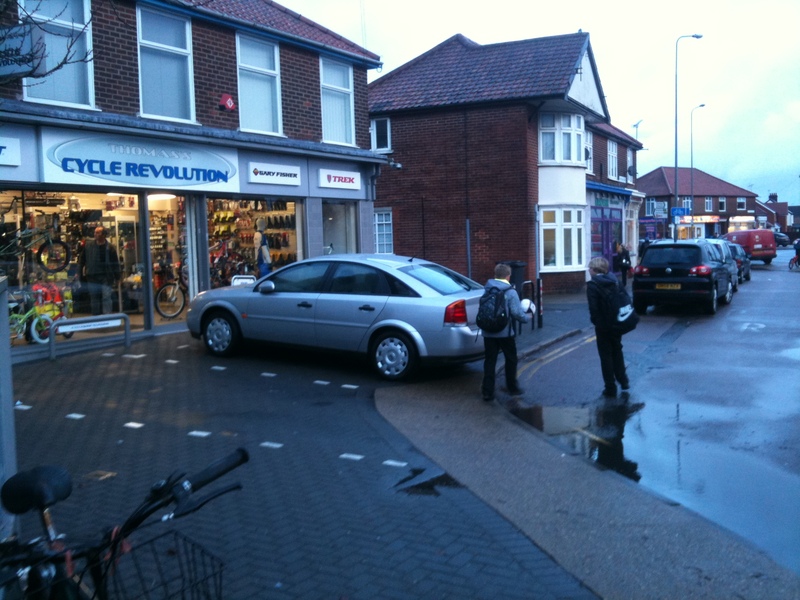 On investigation it turns out that the shopkeeper owns the land right up to the service road and has therefore done what he wanted with it, which in this case was to install car parking even though it is a cycle shop! Children duck into the carriageway, but who knows what a blind person would make of it. The second photo shows that what is presumably the official footway is blocked by an advertising sign although no one would use that narrow path given that there is a perfectly good footway outside all of the rest of the shops. 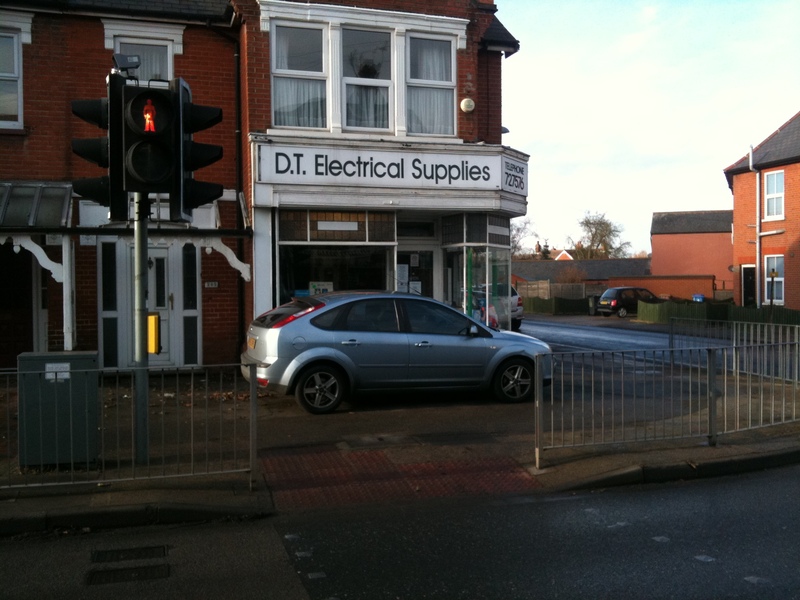 And then there is my local electrical shop. The owner isn’t doing anything illegal by leaving his car on his land but it does create an odd impression – hardly welcoming and very difficult for someone with poor sight. The final picture of Arras Square in Ipswich which has a sign at the entrance which reads ‘No Vehicles’ but which is always full of parked cars about which I posted about a week ago. I have finally got an initial response back from the Borough Council which reads: “Thank you for your email. The position in Arras Square is very complex with several owners and leases involved and only part of the area being highway”. So here we go again! However… in all cases I think the shopkeepers can be encouraged to keep the area clear, especially if they are chain stores with a brand to maintain. Nice bench, shame about the parking! Hardly creating a Cycle-Revolution are they? Mind you, I guess it shows what kind of cyclist they are selling to – the kind that carts their bike around hanging off the back of their car! The last photo and paragraph shows just how weak-knee’d & pathetic our councils are in this country. I mean, they wouldn’t like to upset a poor persecuted motorist would they? All I ever hear off ours in these circumstances is “We have to accommodate everybody” – ‘everybody’ of course being ‘everycar’. I own a car, but use it sparingly & try to go out of my way not to crap on people with it. If the majority would do the same we might get somewhere. I’d be very tempted to sit on the bench in the last photo and put my feet up on the bonnet. Funnily enough I’ve been a customer of that cycle shop, and there was a car parked outside at the time (not mine though, but my dad’s) – I’d come to visit from London and we were getting a birthday prezzie for myself. In London, though, I cycle everywhere (rarely use my Oyster card, and don’t have a driving licence). Shop-keeper parking is an interesting (and unresolved) problem. They don’t get residents parking permits, and want 10hr parking. What they tend to do is use 2hr parking in the peaks, and “shoppers” parking in between. 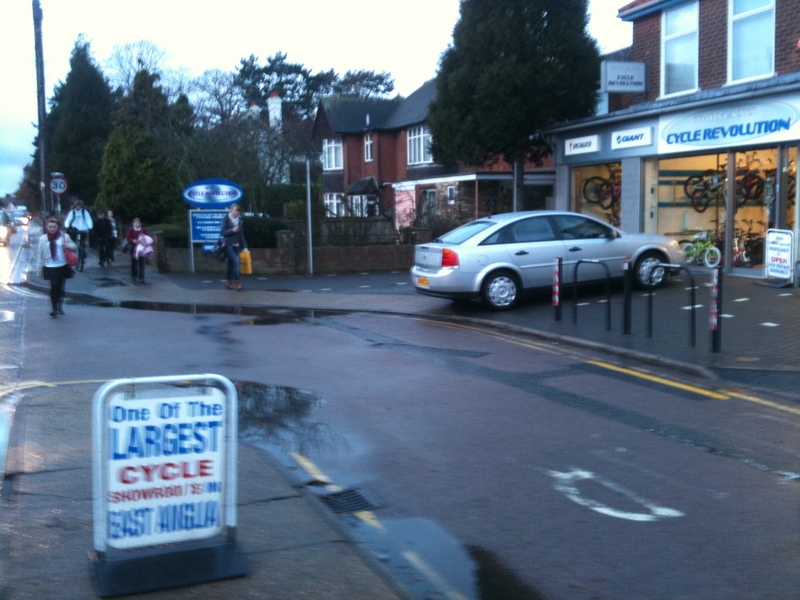 Or wedge their car into a semi-private bit of forecourt. They should be allowed “residents” permits.